Out of the box ideas in recycling waste materials has led to a boost in the growing eco-friendly movement. 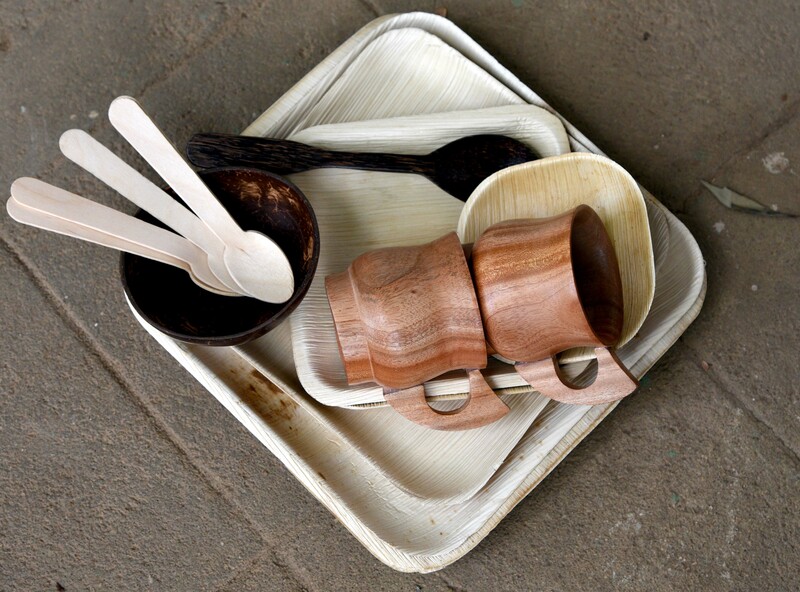 From the nature Harika and Suhasan Reddy with their recycled tableware. The past decade has seen an increase in consumerism to the point where people don’t think twice before veering towards a product that might be potentially harmful to the environment, as long as it is low cost and dispensable, leading to a demand for single-use products. Observing this disturbing trend, a few entrepreneurs have come up with innovative ways to combat it by using materials usually thrown away during production. 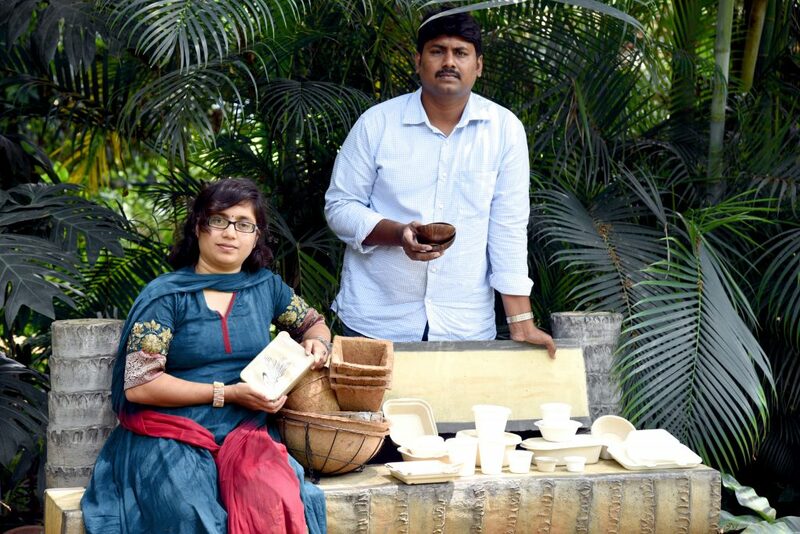 Natural fibre clothing untouched by chemical dyes, biodegradable cutlery, rice husk showpieces are what you get when you log on to Save Globe’s web portal run by entrepreneurs Suhasan Reddy and his wife Harika. “We had been toying with the idea to start a company which dealt with biodegradable products since 2011. Initially, we started with bags, tableware and then turned to coconut coir baskets,” explains Suhasan. The Bengaluru-based firm gets large number of orders from Hyderabad, especially for cloth bags, coconut coir baskets for plants and rice husk artefacts. While Save Globe’s products are made from materials considered useless, Sprout pencil, the world’s first sustainable pencil created by Michael Stausholm is based on the same philosophy but with a twist. Unlike a regular pencil which is thrown away after use, Sprout pencils as the name suggests can help grow a plant after being placed in mud. Stausholm says, the idea came from three students studying at Massachusetts Institute of Technology (MIT) in Boston, USA. “They put the idea on kickstarter.com where I discovered it. In late 2014, we bought the patent and global rights for Sprout pencils,” says Stausholm, who describes it as “a product that matches the spirit of the age”. Wanting to do away with plastic cutlery, Narayana Peesapathy from Musheerabad decided to use his knowledge in managing groundwater levels to create Bakeys’ edible cutlery. Armed with his experience working at International Crop Research Institute for Semi-Arid Tropics(ICRISAT) , he started developing the prototype machines and moulds to produce the cutlery. “I began studying on why groundwater levels were reducing and found that growing more dryland crops like jowar helped in stabilising groundwater level. So jowar became one of the main ingredients in the edible cutlery,” states Narayana. The cutlery is manufactured using a mix of jowar, rice and wheat flour and becomes soggy 10 to 15 minutes into the meal and can be eaten at the end. Currently, he is working on creating cutlery made from millets and other ingredients. “It’s very easy to make small changes in the way we approach our everyday activities. Such changes have a lasting impact, all one needs is a little ingenuity,” feels Narayana.